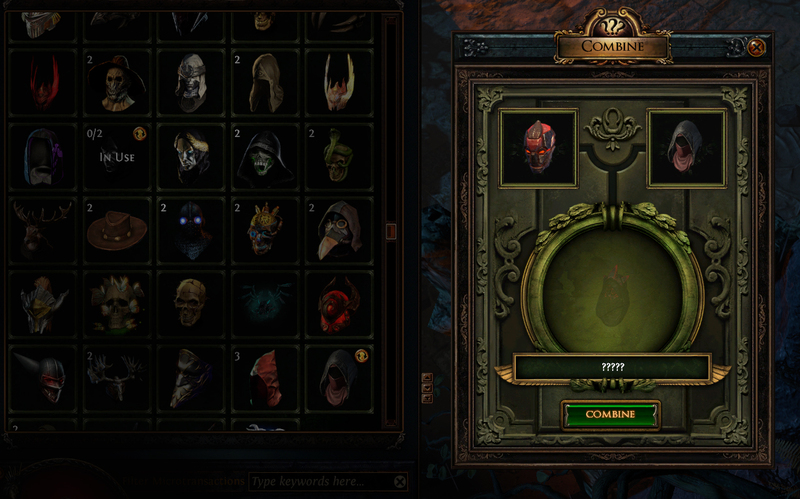 Friends of Path of Exile, the Apocalypse Mystery Box has just been released! With 38 all-new post-apocalyptic microtransactions, you will explore the conflict between the tyrannical automatons and the wasteland rebels that won’t surrender! Each Box costs 30 points and it’s guaranteed that at least one of its containing microtransactions will be of equal or higher value. Different designs can be combined for a more in-depth character customization and the possible combinations may be worth from 30 to 320 points! Check out the trailer below! To combine your microtransactions, press “M” to visit microtransaction stash, choose the two items you wish to combine and click the small gold icon at the top right corner. This will take you to the combining screen where you just have to press the “Combine” button and you are ready! Note that once complete, the combination is final and can’t be undone. If the combination you are trying doesn’t have the gold symbol, then you are either missing a part of the set or it’s just can’r happen! The microtransactions that can be combined are the Automaton and Wasteland Armour Set Pieces, Automaton and Wasteland Cloaks, Automaton and Wasteland Wings, Automaton and Wasteland Portal, Automaton and Wasteland Helmet Attachments and Automaton and Wasteland Footprints. When you buy a Apocalypse Mystery Box, you will find it in the Consumable section of the microtransaction stash in-game ready to be opened!